I'm aliiiiiive!!!! Barely. 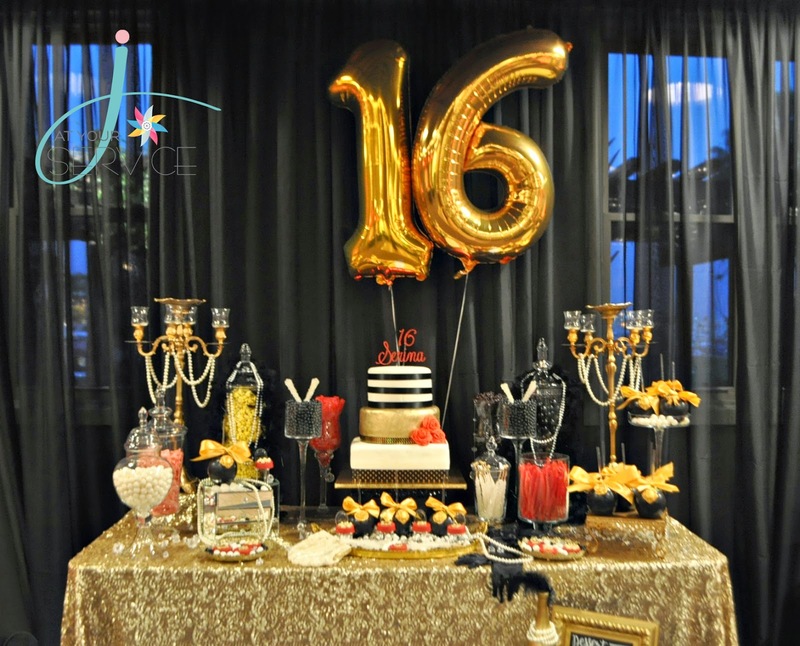 We recently celebrated our daughters 16th birthday and I've never worked on an event of this size or kind. My style of work is typically funkier, colorful and definitely NOT glam. So when the theme was chosen, I knew I was going to need help to create the look I wanted for her. 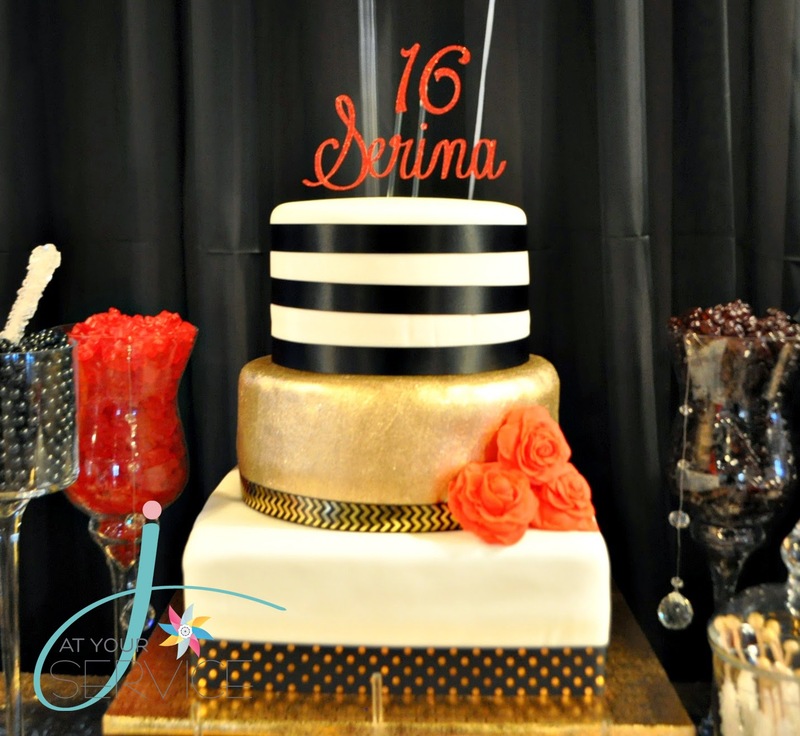 My daughter wanted a glam Hollywood (kinda) style, with black, gold and red. I have mad respect for those event planners that put these types of events together. 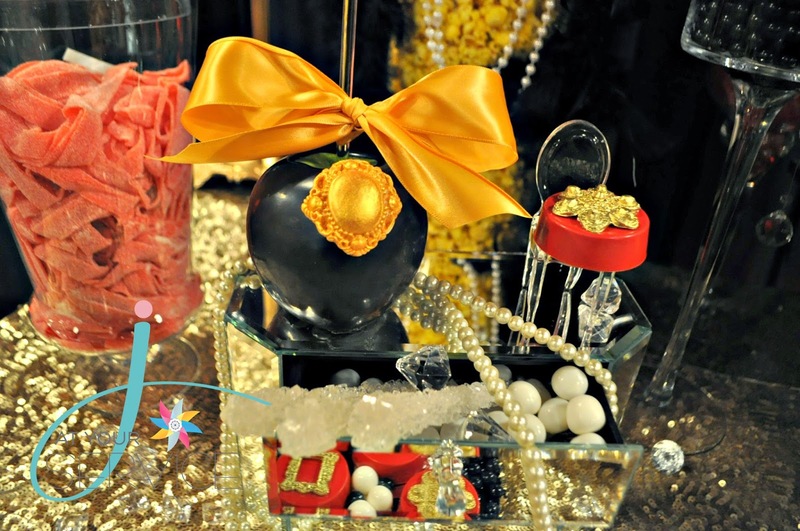 Most of my parties are here at home and a smaller scale, so this was a traumatizing experience! 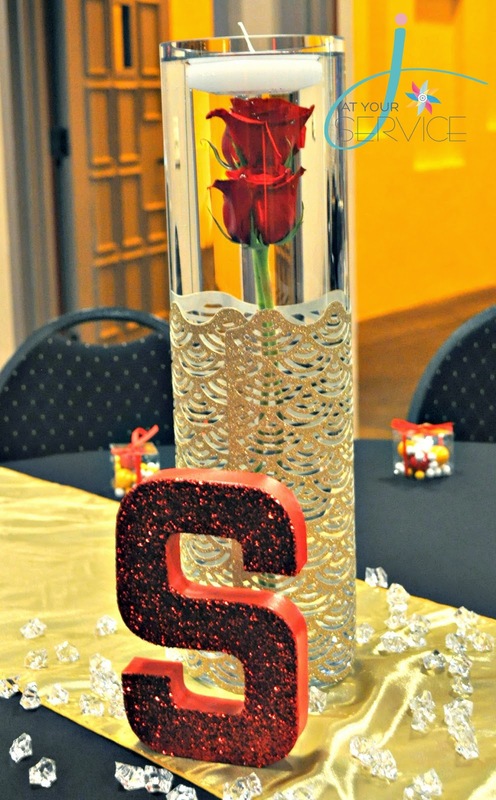 We had about 100 guest, rented a hall, food service, bartender, candy table, installed rentals and a Photo Booth service. I'm still shocked that I was able to pull it off! Haha! 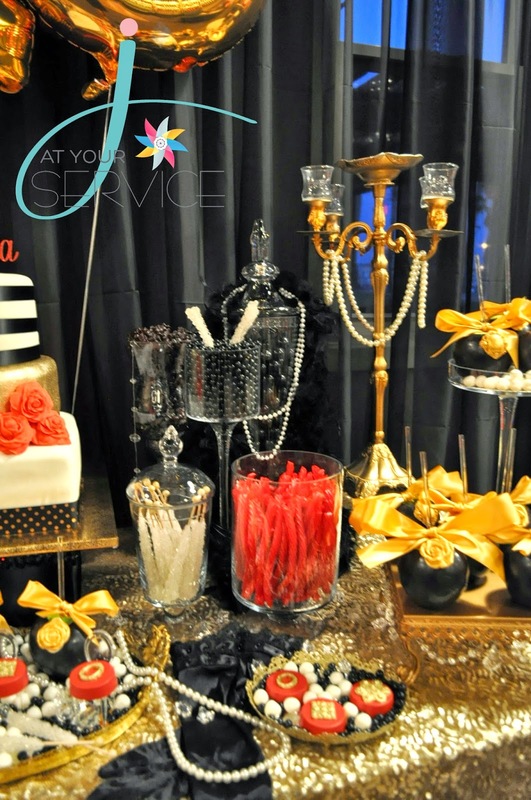 Once I knew the theme, I knew that I needed my friend Monique of Dolce Bliss Events to create the candy display for me. She is a genius when it comes to these style of tables! I'm so glad she was part of this because it would NOT have been as gorgeous as it was, had I done it myself. She even helped me set-up my tables, when I was going crazy. THANK YOU so much amiga! You are truly amazing! One thing I did slip on was getting a photographer. DOH! I normally take all my photos but at home, during the day, is a lot easier to handle. So please excuse my photos! This was indoors and at night, with horrible lighting. Not only was I not able to get good photos but when you're the host of a REAL party, it's so hard to get photos of your guest or even yourself. Fortunately, I managed to get a photo of the birthday girl at least. This gorgeous cake was made by my SUPER talented friend, Silvia. 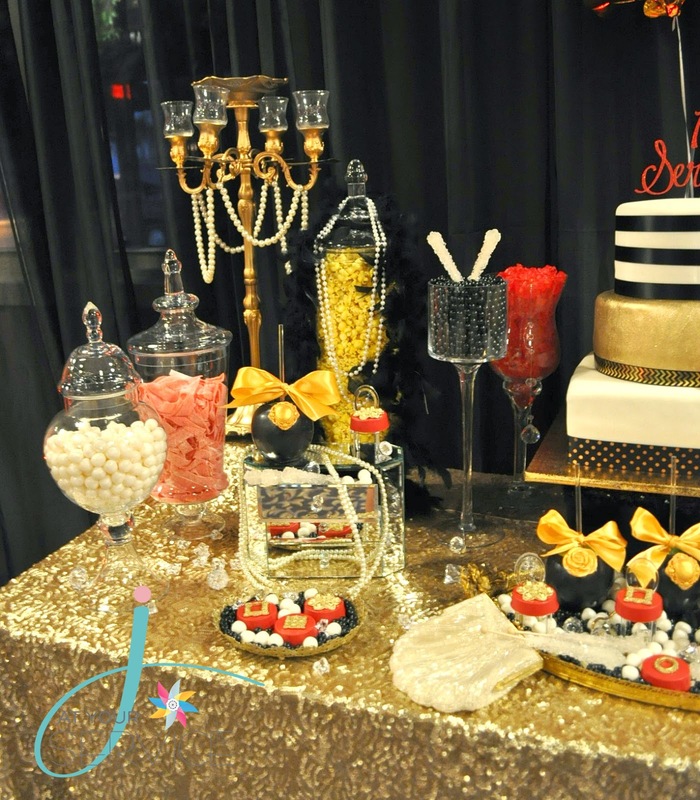 Check out her FB page, Silvia's Cake Creations and if you're in the L.A. area, I suggest to contact her for your next party. She made Nate's Robin and Sonic cakes. She'll definitely be doing Nate's next party cake! 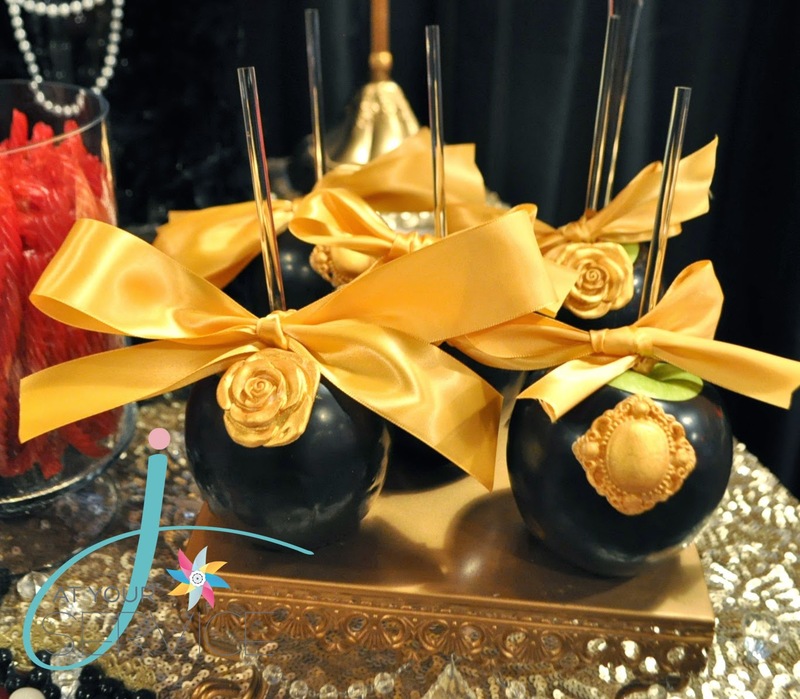 Monique contacted Sugar Studio 31 for these beautiful chocolate apples. I had no idea they were so close to me! You bet I'll be ordering from her again! Do you see how gorgeous this table is?!?! 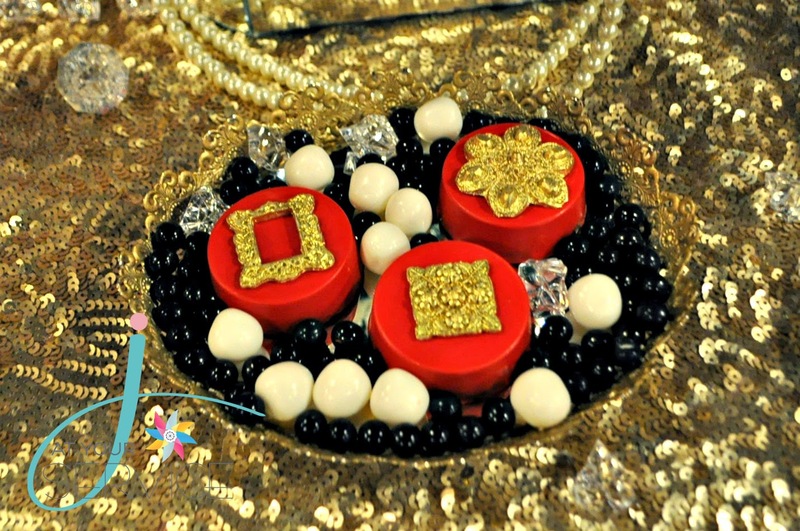 Monique also ordered these beautiful chocolate covered oreos from Bella's Bakery & Boutique. Love the chalkboard sign from Whimsy and Wise! Glam number 16 by Creativities Galore. 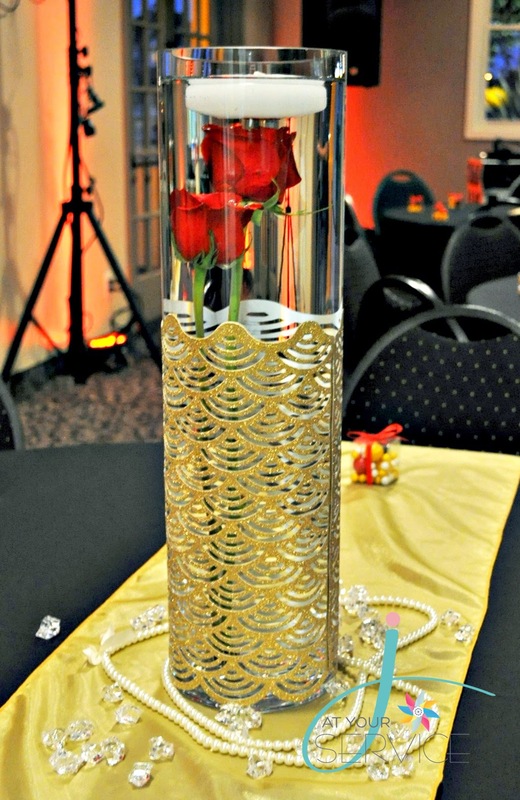 My friend Roxanne was kind enough to lend me her tall cylinder vases for my centerpieces. 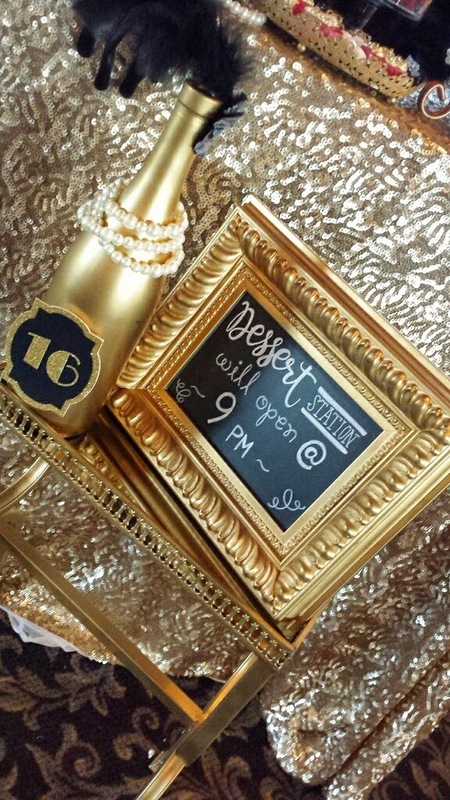 I was stocked to find these glittery gold die cut paper accents by David Tutera, at Joann's. They were PERFECT! 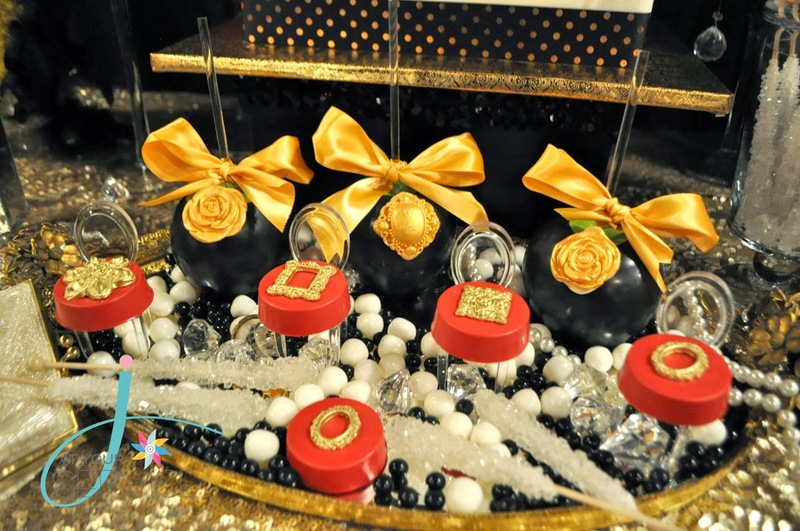 All I did was add red roses and floating candles, with pearl and jewels surrounding. 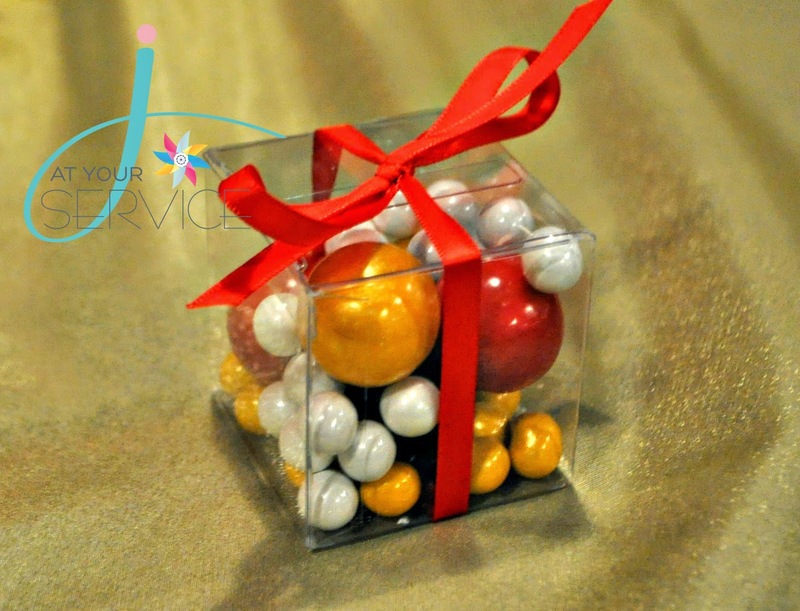 Candy favors with clear plastic boxes from PaperMart. 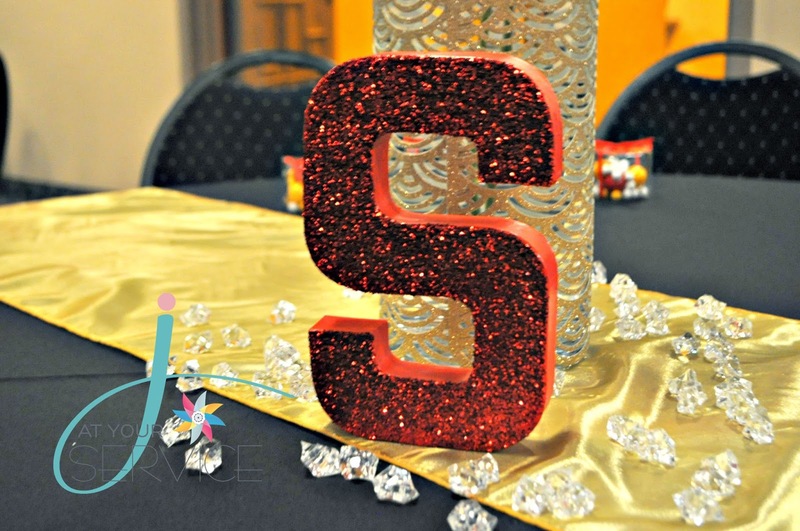 I painted and glittered up some cardboard S's for some of the tables decor. 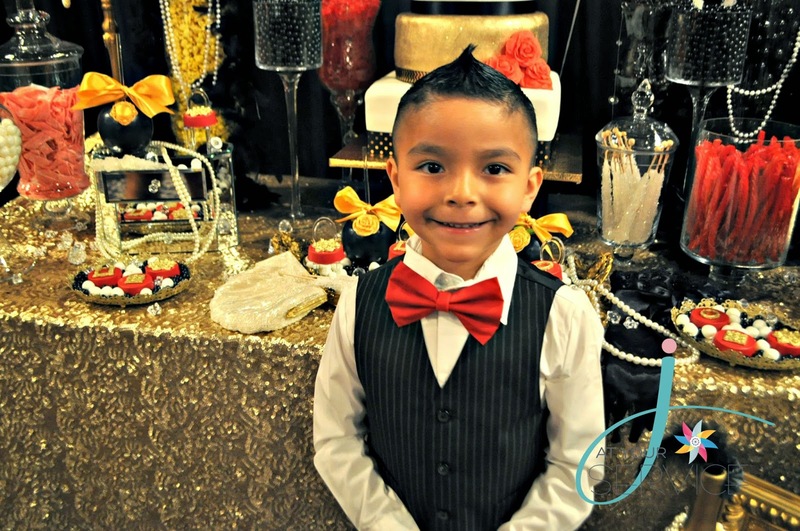 How handsome is my little guy in his custom red bow tie from Pink Laundry Shop!?!? Love it!! Ceiling lights and red wall lighting. 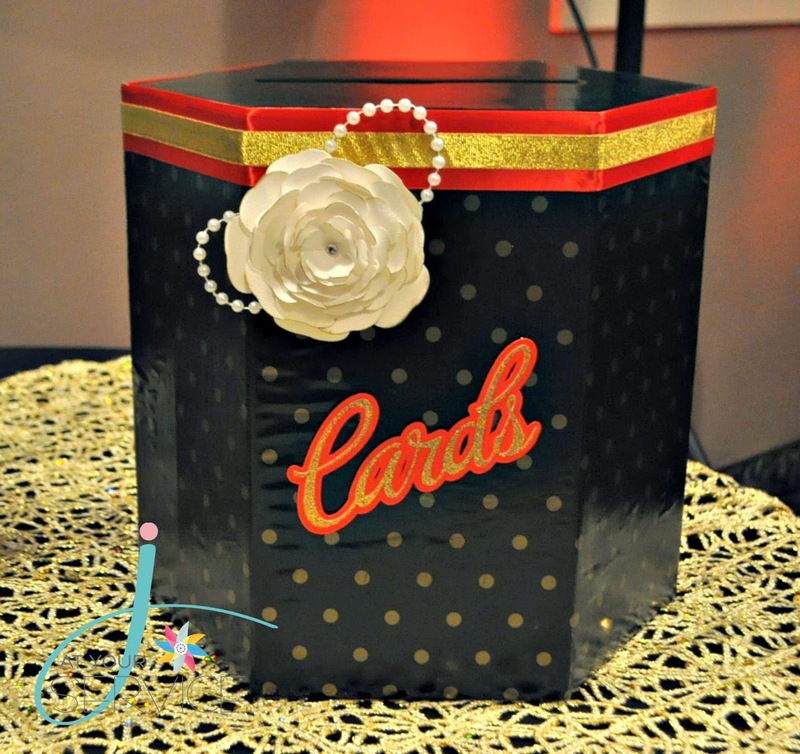 Because teens don't really get wrapped gifts, I decorated this gift card box to fit the theme. Here is the slideshow that I made for my daughter and played at the party, on a big projector. 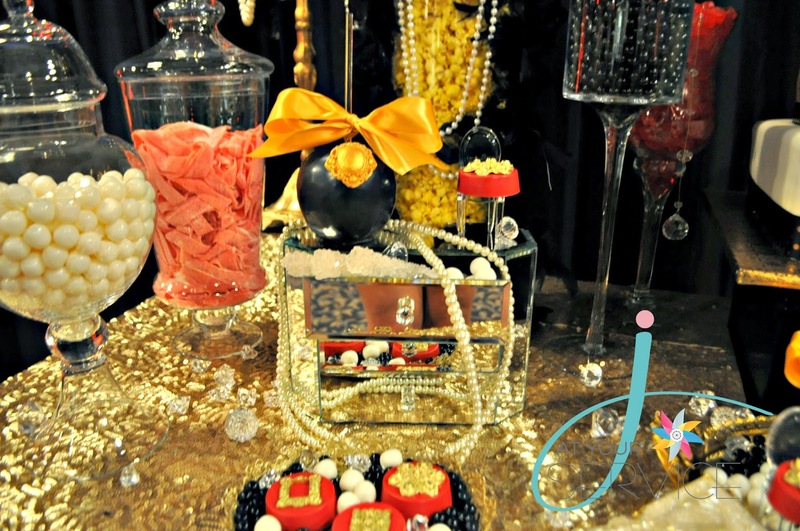 What a wonderful party you had, especially I just loved the color combinations you have used for the party. 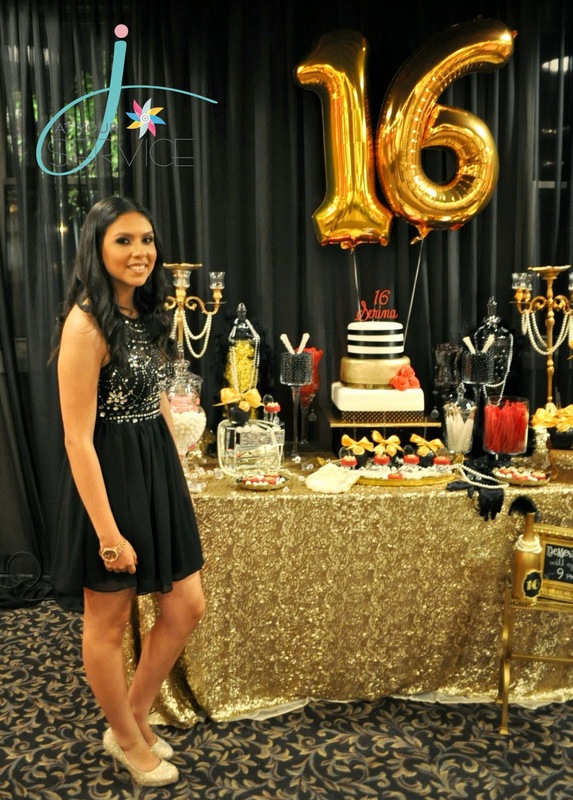 My daughter had her party at New York venues and we hired planner for that. I am glad that party went really well.